A drunk driver plows into a fence at high speed. When he comes to, he can't understand how he and the car are inside a farmer's fenced field. The fence is intact until police investigators cut the wire to remove the car. In Dover, Pennsylvania, a car hit an icy patch of road along a curve and skidded into a fence. Acting like a giant rubber band, the fence wire snapped the car onto the opposite bank. The car was totaled, but damage to the fence was minor, only a few pulled staples. The wire itself was fine. A freight train loaded with coal derailed a few years ago on Kencove Farms in Blairsville, Pennsylvania. When the insurance claims assessor arrived, he couldn't believe his eyes. The track and freight cars were badly damaged and coal was scattered over much of the field, but the fence wire was not broken. Though these stories seem far-fetched, they are all true. High-tensile fences are the "stars" of each account. Charles Kendall, owner of Kencove Farms, is a soft-spoken man not easily excited. That is, not until he begins to talk about high-tensile fencing. 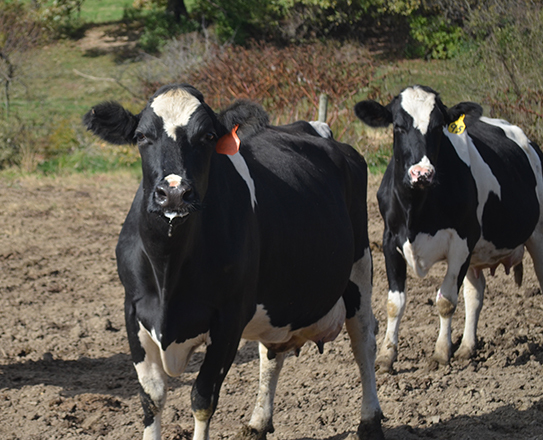 "When I took over my parents' farm, one of my first projects was to build a 'good' fence where I intended to pasture my heifers. Even with barbed wire fencing, those heifers always seemed to think it was worth the pain and effort to get to the corn and alfalfa crops on the other side. Electric wire was helpful, but required constant checking. Cattle were always pushing it onto the barbed wire where it would get caught and short out the fence. After only five years, my barbed wire fence was falling apart so badly from rust that it was useless. What a disaster! "I had read the claims of high-tensile fencing and decided to test for myself whether these were true or not. My first high-tensile fence, built in 1979, was a three-wire electrified fence for cows and heifers. Costs were kept to a minimum by using pressure-treated posts at intervals of 50 feet. The 12½ gauge, high-tensile wire had greater strength and resilience than any other farm fencing I had tried. Occasionally, the heifers did go through the fence when the electricity was off for long periods, still they didn't damage the wire. "Next I replaced the barbed wire 'disaster' with a seven strand high-tensile fence. This gave deer control and was more secure for my farm animals. Solid, treated, wood line posts were spaced 200 feet apart. Fiberglass posts were driven at 67-foot intervals. Between these, fiberglass spacers were clipped to the wire but not driven into the ground. All wires were insulated for electricity. Even with the electric off most of the time, this fence has been great. "I have tested and proven high-tensile fencing is an all-win situation for farmers. It's stronger, longer lasting, and more economical than other types of fencing. A neighbor's cow and calf went up and down through a conventional fence. In two hours' time, they had torn down 40 acres of fence. That just wouldn't have happened with high-tensile fence. They may have torn out a few staples, but they could not have snapped the wire." Though high-tensile fencing has been used on the vast sheep and cattle ranches in Australia and New Zealand for over 30 years, it has only recently come to the attention of the American farmer. High-tensile fences are made with smooth wire pulled to an initial tension of 250 pounds. The wire is held on fence posts with staples. These staples are driven at a slight angle off of vertical so the slash cut points steer the staple into different grains of the wood. The staples are not driven tight against the wire, but instead allow the wire to move during tensioning, temperature changes, or livestock pressure. Today's high prices have forced farmers to look for ways to cut costs and seek greater value for their money. Farmers who have tried high-tensile, smooth-wire fencing have found it to be the answer to their fencing needs. One of the major causes of wire fence failure is exceeding the elasticity of the wire. Kencove’s Max-Ten 200+ high-tensile wire can withstand over 1,600 pounds of pull before breaking. That’s nearly twice that of two-ply barbed wire. A tree falling on a high-tensile fence would only have to be removed by the farmer. The fence wires would be unharmed. But with conventional fencing, it would force the farmer into a major repair job. Another source of fence failure is rusting. With class III galvanizing, a high-tensile wire fence should last over 30 years in Pennsylvania, outliving three conventional fences. "An extra plus is the zinc coating on the wire turns white as it ages, instead of rusty brown, making it very attractive as well as long-lasting," added Kendall. "When you have an expensive animal, you want an attractive, expensive-looking fence. That helps sell your animals." The cost, however, is low. "A basic, no-frills, 6-strand, high-tensile fence can cost less than 22 cents per linear foot. With this fence, the farmer would provide his own tools and fence posts. Of course, some of the extras like tension indicator springs are appealing and weren't even options with conventional fencing," said Kendall. High-tensile fences are fairly easy to install and maintain, so pretty much anyone in the family can build them. The hardest part is driving the posts. The wire comes in 53-pound or 105-pound coils. 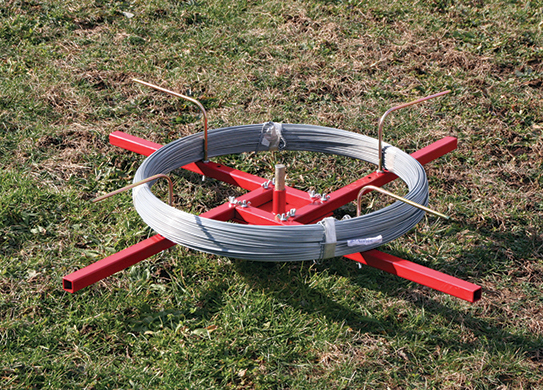 The coils are placed on a spinning jenny, and the wire slides easily so it can be walked along the fence perimeters. The wire is then stapled onto the posts. "It has a high-tech look. Evenly spaced, parallel wires that make you proud to say, 'I built that fence.’ With the right tools, high-tensile fences are not hard to build if directions are followed and experts are called when the fence builder has questions. Shortcuts don't pay. If you have tried high-tensile fencing and it isn't working, call an expert. He can save you hours of drudgery." With high-tensile fencing, there is greater safety for humans and animals. There are no barbs to damage hides or swollen udders and no broken bones when a contrary animal charges at the fence. Because of the elasticity of the wire, the animals bounce off. High-tensile fencing offers versatility. The fencing is tailored to the livestock and pasture needs of each individual farmer. There is also greater livestock restraint and predator protection. "A few years ago, the California sheep industry was being wiped out by coyotes. A 10-wire high-tensile fence built with electric on alternate wires controlled the coyotes, solving the problem." noted Kendall. Kendall was so impressed with his high-tensile fences that he started gradually into the fencing business himself. Five years later, he sold off the cows and went into the business known as Kencove Farm Fence full-time. "Having grown up on a farm, I knew the fencing problems that the farmer needed to solve. I feel that I can help other farmers and enjoy doing this. I put myself in the individual farmer's position and try to find what is most economical according to the farmer's needs." To keep prices as low as possible, Kendall seeks the best values on tools and fencing materials. As a result, he has traveled to various states in the United States as well as to South Africa, New Zealand, and Taiwan. He always is looking for better techniques and ways to make a good product even better.